James Comey broke the sacred trust of the American people. He perpetrated a fraud on the American people. The now fired FBI Director conducted a fake criminal investigation into Hillary Clinton. It has become apparent that he prejudged the investigation and predetermined the outcome months before interviewing key witnesses and Hillary Clinton herself. Today we’re launching our own investigation into Comey’s corruption. The reality is there was not an actual investigation. . . . Worse yet, Comey used his position of power to toy with the democratic process during a crucial election. In the face of this corruption, we’re taking action. Today, we issued FOIA requests to the Federal Bureau of Investigation (FBI), the Department of Justice (DOJ), and the Office of Special Counsel (OSC). The information requested should reveal whether Comey’s investigation last year into Secretary Clinton’s handling of classification was a sham and/or his decision prejudged. On July 5, 2016, James Comey, then-Director of the FBI announced during a press conference that the FBI would not be pursuing criminal charges against Secretary Clinton for the handling, or mishandling, of classified information despite the fact that “evidence of potential violations of the statutes regarding [Secretary Clinton’s] handling of classified information” existed. Last week, we learned that the Obama Administration’s investigation (led by Director Comey at the FBI and Attorney General Lynch at the DOJ) into Secretary Clinton’s handling of classified information was a sham. In a letter to FBI Director Wray, dated August 30, 2017, the U.S. Senate Judiciary Committee revealed that during its investigation surrounding Comey’s removal and his conduct in handling the Clinton investigation, the information it had gathered and reviewed from the OSC (information collected by the OSC during its investigation into whether Comey violated the Hatch Act) revealed that Comey had already decided he would issue a statement exonerating Secretary Clinton months prior to his July 5, 2016 announcement not to pursue criminal charges. Former Comey aides interviewed by the OSC (including Comey’s Chief of Staff, Rybicki) indicated that the then-Director circulated early drafts of his statement exonerating former Secretary Clinton in the spring of 2016. Astoundingly, at the time this statement exonerating Clinton was prepared by Comey and circulated to his former aides, the FBI had not yet completed its investigation and the interviews and/or follow-up interviews of seventeen key witnesses, including Secretary Clinton herself, had not yet occurred. The Senate Judiciary Committee also revealed that the Justice Department entered into “highly unusual immunity agreements” with Secretary Clinton’s Chief of Staff, Cheryl Mills, and Heather Samuelson (Clinton’s lawyer who was tasked with going through Clinton’s emails and deciding which ones to delete) in June 2016. These immunity agreements limited the FBI’s ability to review certain Clinton email archives and prevented the FBI from reviewing emails after Secretary Clinton left office – “the period in which communications regarding destruction of concealment of federal records would have most likely taken place.” In addition, the immunity agreements required that the Justice Department destroy evidence – including all records and laptops it retrieved – even where the evidence had not be fully reviewed as part of the investigation. 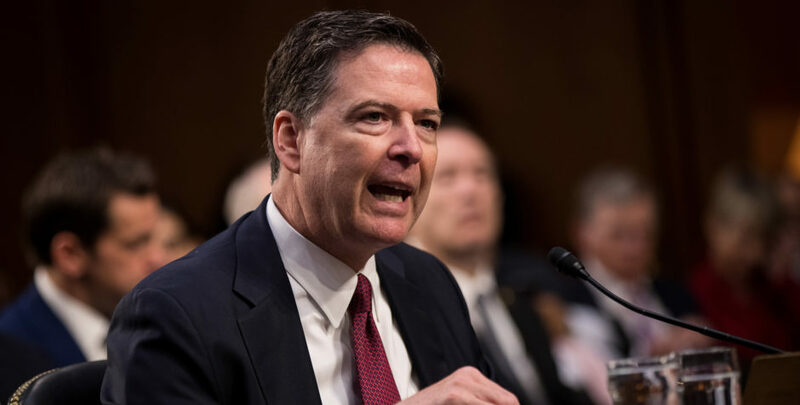 In light of this information, the ACLJ is requesting all records concerning or relating in any manner to the decision of the FBI, as announced by then-Director Comey on July 5, 2016, not to pursue criminal charges against Secretary Clinton. The records requested in our FOIA requests also include (1) all records provided to the OSC in the course of its now-closed Hatch Act investigation of Comey, (2) all drafts of Comey’s statement exonerating Clinton before the investigation was completed, (3) all “evidence of potential violations of the statues regarding the handling of classified information” as referenced by Comey in his July 5, 2016 statement, (4) all records concerning the immunity agreements entered into between the Justice Department and witnesses and/or subjects of the FBI’s investigation of Secretary Clinton, and (5) all grand jury subpoenas obtained by the FBI to compel information from Secretary Clinton’s internet service providers (so that we can evaluate what information was collected and/or destroyed). Further, the ACLJ’s FOIA request asks for all memos Comey may have prepared in the course of his investigation. In addition, ACLJ has requested the transcripts for all interviews of FBI employees conducted by the OSC regarding Comey’s investigation into Secretary Clinton.